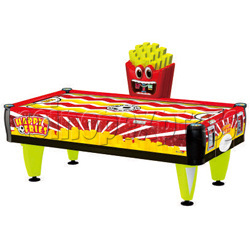 Happy Fries Coin-Operated Air Hockey Table for Adults is a latest electronic air hockey table, features with compact size table, suitable for two adults or kids, designs with a cup of fries with score and time display stand next to the machine, it is a perfect table with a large and bright playfield table, it is a two players size table, attracts for any player. This is a coin-operated air hockey, easy to operate. Players just need to shoot the puck onto the opposite puck entrance by the pusher.